Product prices and availability are accurate as of 2018-12-04 16:48:14 EST and are subject to change. Any price and availability information displayed on http://www.amazon.com/ at the time of purchase will apply to the purchase of this product.
? This glue gun sealing wax was first introduced in 2001, with the revelation of how fast and easy the application with a glue gun could be. ? The glue gun application method allows for exact placement of the wax. Use a full sized, low temp glue gun (not a mini craft gun). ? Since this is a flame free method, the wax impression will not contain any soot or scorching from a flame. ? Each stick is handmade in Seattle studio, small batch blended. ? Rated by FDA for contact with food - great for bottle topping and food packaging. Popular for wine bottling, as well as homemade vinegars & food packaging. ? Full set of instructions, tips, and application ideas are included with each wax package. 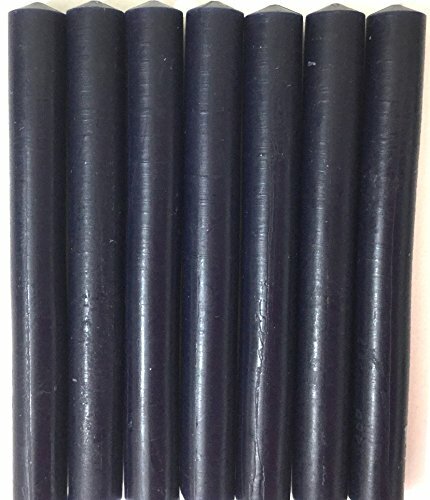 The Original Glue Gun Sealing Wax - Flexible for mailing & handling. Use with any standard sized, low temperature glue gun for easy & fast application. Complete a large number of wax seals in just a few minutes. Very popular for wedding & holiday applications. 7 sticks will create roughly 70-80 wax seals when used with a 0.75" wax seal stamp.